At the 29th Boréal Convention in Quebec City on May 6, 2012, Éric Gauthier was awarded the Prix Aurora-Boréal for his fantasy novel, Montréel (Alire), accompanied by the SF Canada Award of $500. For over 30 years, Canadian fans of speculative fiction have been voting on the Aurora and Boréal awards to acknowledge the best of Canadian professional and fan activity in both official languages. 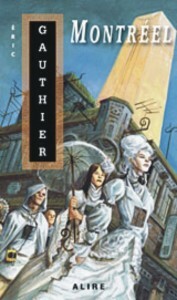 Gauthier, a seasoned storyteller who captures the attention of his readers by offering a Montreal almost unrecognizable in a world of magic and ghosts, was also awarded the Prix Jacques-Brossard for the same work.